On Sale Now! 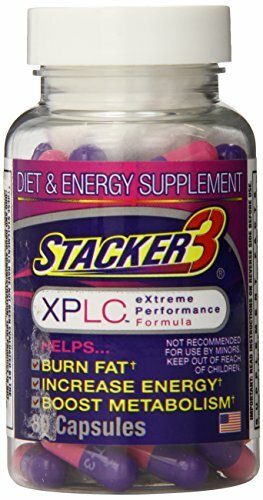 Save 7% on the Stacker 3 XPLC- Extreme Performance Formula | Burn Body Fat, Boost Energy & Kickstart Metabolism (80-Count Bottle) by STACKER 2 at Need to Diet. MPN: 2080082. Hurry! Limited time offer. Offer valid only while supplies last. Stacker 3 XPLC is another new thermogenic breakthrough formula that can help you burn stored body fat thanks to a process called Lipid Mobilization. Stacker 3 XPLC is another new thermogenic breakthrough formula that can help you burn stored body fat thanks to a process called Lipid Mobilization. In vitro research shows that Lipid Mobilization is one of the processes that release fat into the bloodstream to be burned as energy. On the fat cell's surface are receptors that signal the cell to hold stored fat. A natural antagonist in new Stacker 3 XPLC chemically switches off these receptors. Freed fatty acids can then move out of the cell and into the bloodstream. In combination with the enhanced thermogenic agents and energy boosters, this proprietary formula is designed to help you burn stored body fat while delivering an additional boost of energy. Get the help you need from a name you know. Stacker 3 XPLC is from the manufacturer of Stacker 2 "The World's Strongest Fat Burner". ✔ LOSE BODY FAT: Quick & efficient diet pill with a natural blend of herbs which promotes weight loss from stored body fat. ✔ FAST, EFFICIENT & EFFECTIVE way to achieve your personal weight management goals! If you have any questions about this product by STACKER 2, contact us by completing and submitting the form below. If you are looking for a specif part number, please include it with your message.